The name of this pretty Grade II* listed building comes from a former owner with whom William Wordsworth lodged during his time at Hawkshead Grammar School. 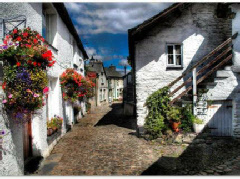 Offering accommodation to visitors to this splendid part of the Lake District since 1990, Ann Tyson’s House provides both bed & breakfast and self-catering options. Interestingly, within one of the guest rooms of the former is a bed that once belonged to the writer John Ruskin (it having been purchased at auction from his home at Brantwood near Coniston in 1933). Boasting plenty of period charm, Ann Tyson’s House features just 4 guest bedrooms including a single for those travelling alone. Well behaved dogs are very welcome by arrangement.